The new Apple baby iPhone 5S is set to go on sale this Friday, Sept. 20. It will face stiff competition for consumer's attention from the high-end Android market. One of the most popular Android smartphones around right now is the Samsung Galaxy S4. Here we've pored over the two superphones and cogitated long and hard to see which reigns supreme in terms of design, specs and more. 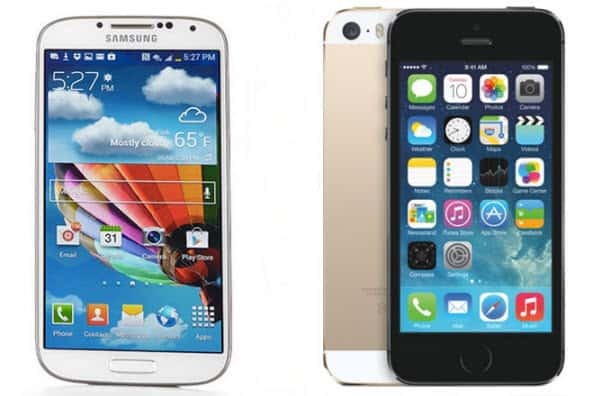 How does Apple's new iPhone 5S compare to Samsung Galaxy S4? Let's take a quick look at the comparative table below to have a rough understanding first. As is traditional for an 'S' model, the iPhone 5S design looks pretty much the same as that of the iPhone 5, but it comes with multiple color options - silver, gold and space grey. This means it's lighter, thinner and smaller than the Samsung Galaxy S4. The iPhone 5S is the phone if you want to be able to do everything with one hand, so it will likely be a more popular choice for smaller-handed people. Apple is touting the world's first 64-bit processor (the A7 processor) as a major upgrade for the iPhone 5S. It's the first smartphone with a 64-bit chip inside and Apple is claiming that the iPhone 5S is twice as fast as the previous model in both CPU and graphics performance. With the Samsung Galaxy S4 processor set to be a 1.9GHz Qualcomm Snapdragon 600 in teh UK, the Korean manufacturer will also offer a 1.6GHz octa-core Exynos 5 powered device for other markets. Different processor models are dependent on region. There's also 2GB RAM, 16/32GB internal memory and microSD support, adding a microSD card for up to 64 extra GB of storage. The iPhone 5S boasts an improved camera, widely regarded as one of the best on any smartphone. One of the first places you're going to notice the improvements are on your low-light indoor shots. Apple has managed to make the sensor larger and increase the size of each individual pixel so more light hits your sensor, meaning the camera sensor can get access to more light via the lens opening. On the Galaxy S4 you'll find a 13-megapixel rear camera, reportedly at 1.1 microns per pixel; and 2-megapixel front-facing camera, capable of 1080p video capture, while the iPhone 5s's front facing camera, or FaceTime camera, is only a 1.2 MegaPixel lens. There's also a BSI, auto focus, digital image stabilization, and tons of special software features to help make your camera experience the best possible on the GS4. One of the most exciting new features on the iPhone 5S is the fingerprint sensor, which replaces the home button with a scanner, letting you unlock your iPhone 5S and buy things from App Store or iTunes with a press of your finger. Meanwhile, one of the selling points of Samsung's Galaxy S4 is actually a "no touch" screen control. With Air Gesture, users can answer calls and flip between screen by just waving a hand at the screen. iPhone 5S and the Samsung Galaxy S4, even though different from each other, seem like a Roland for an Oliver. Whichever you like, one thing for sure is that both iPhone 5S and Samsung Galaxy S4 offer users splendid visual experience. If you want to make the best of the two gadgets, such as importing your favorite DVD movies to iPhone 5S or Samsung Galaxy S4 for enjoyment at will, MacX DVD Ripper Pro provides a handy solution to rip and decrypt DVD to MP4, AVI, FLV, H264, etc, which can be smoothly played on iPhone, iPad, Surface, iPod, Goodle Nexus and so on as easy as pie. Beyond that, if you are crazy about the YouTube videos and want to download them and transfers to the phones, MacX Video Converter Pro would be your good assistant. Besides downloading YouTube videos, you can also use it to convert both SD videos and HD videos like MKV, MOV, FLV, AVCHD and M2TS to your Apple, Microsoft, Android and other phones for playback in a flash. This tutorial can best remove your annoyance for it introduces you an easy solution to convert DVD to your Android device with a professional DVD ripper for android tablet.